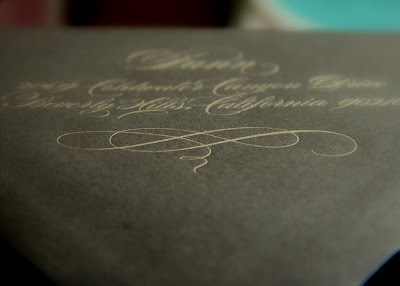 This is one of the most gorgeous envelope flaps I've ever done. 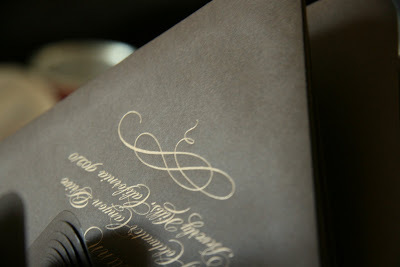 Printed in metallic gold on chocolate brown envelopes, the letterpress printing is so so lavish and elegant. The pictures don't quite capture how gorgeous these envelopes are. The custom Christmas card that goes with it (sorry I don't have a picture just yet) is equally as lavish, and I'll have to share Christmas card when I get back. I'm in Hawaii at the moment, visiting family and friends, but I was looking back at all the press clippings and realized that I forgot to post a couple! 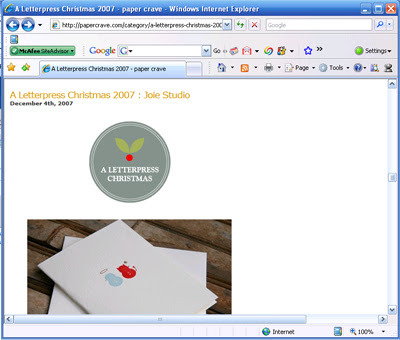 Paper Crave featured Joie Studio in its Letterpress Christmas 2007! Thanks to the two sites for promoting Joie Studio! Thank you to everybody for such an amazing holiday season! Happy holidays, merry everything, and we wish you a great 2008! 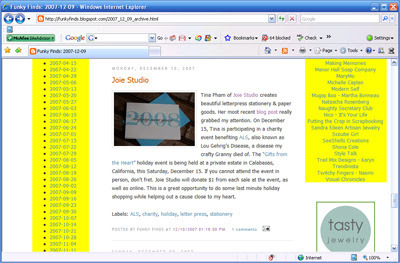 Joie Studio will be closed through the New Year while we breathe, hit reset, and get ready for a rocking good 2008! I'll still be checking messages and email, but don't expect too much from me until January 2nd. Joie Studio has a new phone number! It's 626-628-9665. Please make note of it. Our old number will stop working January 1, 2008. So I've seen the tagging on other blogs, and I guess I should have known that eventually I would be tagged. Parsiri tagged me, and so, as I'm procrastinating on things I need to do today, here we go. Link to the person that tagged you and post the rules on your blog. Share 7 random and/or weird things about yourself. Tag 7 random people at the end of your post and include links to their blogs. Let each person know that they have been tagged by leaving a comment on their blog. 1. I'm very good at languages. I was, at one point, quadrilingual. My first language is Vietnamese, my second English. In high school, I took three years of Japanese. In college, I took another two years of Japanese, studied abroad in Japan, and then studied German in Vienna, Austria. I'm way out of practice with the Japanese and German, but whenever we go to traveling, I tend to pick up the local accent and/or language pretty easily. 2. I love the beach, but I hate sand and I don't go to beaches in California. I am from Hawaii, and the beaches there are so much prettier than the beaches here. And as for sand, well, sand gets in to everything, and it's not so fun when it gets into everything. 3. My old roommate has songs on both Grey's Anatomy soundtracks. I used to live with Mike TV of Get Set Go, whose band has had some commercial success, selling a bunch of songs to TV shows, most notably Grey's Anatomy and Weeds. It was a trip and a half when I heard his song for the first time in the background while watching an episode of Grey's Anatomy. It was almost like he was in the next room over all over again, practicing his music. 4. I saw snow fall for the first time when I was 20. I was living in Vienna, Austria, at the time, and snow started falling. I grew up in Hawaii, and my parents had taken us up to see snow when we were little, but the snow was never falling at the time. I remember I was wearing a black down jacket, and when I looked down, I saw snowflakes. Perfectly formed snowflakes, like the snowflake designs you see. It was the most amazing experience to see these little pieces of beauty against black, art created by nature. To this day, I am still so moved whenever I see snow fall. My husband and I were staying at a cabin in Big Bear once, and one night Joel called me outside. It had started snowing, and in the moonlight and streetlight, it looked like glitter was floating from the sky. 5. I am secretly afraid that technology has passed me by. For many years, I was a web developer, and to this day I make websites, consult on backend architecture, and still have private clients that need me to tutor them in how to use computers. But my husband bought this fancy universal remote, and I have such trouble using it. And sometimes I feel stupid when I can't figure out the Garmin Nuvi he got me for my birthday. 6. I teach afterschool enrichment classes in Math and Debate for grades 7-12 a couple days a week. I was quite a good debater in my day, and was taking university math classes in high school. I do this to help pay for the money pit that is letterpress. Plus, the kids like me. 7. I own two cats named Jezebel and Sambora and a dog named Romeo. When the press is going, Jezebel supervises the printing while Sambora sleeps on the desk and Romeo guards the front of the press room. Well, I'm hoping that you enjoyed this post! Now onto real work! I wasn't going to do another craft event this holiday season because it's super time-consuming and I'm not yet done with holiday cards (GEESH). But when Dani, one of the organizers of this event, approached me to do this charity event to benefit ALS, I could not say no. My friend Brandon's mom died of ALS, and it's not a disease you would wish on anyone. We will be at this event in honor of Brandon and in memory of his mom. In addition, Joie Studio will be donating $1 for each item sold that day, at the event AND online in the Etsy shop, so I won't be offended at all if you all wait and shop on Saturday. HOWEVER, I won't be babying the Etsy site that day. If something that you want has sold or you want multiples of a certain item, just email me at shop[at]joiestudio.com with what you want on Saturday and if I still have it in stock, I will count that towards the ALS benefit. Following is the press release for the event. Spread the word! Joie Studio is proud to be a participant in “Gifts from the Heart” holiday event to be held at a private estate in Calabasas, California, on Saturday, December 15, 2007. “Gifts from the Heart,” a holiday shopping event featuring an exclusive list of vendors, is geared towards shoppers who want to find one-of-a-kind gifts for men, women, children, and pets. Joie Studio will be joining Sugar and Spice Clothing, Lynnda Rakos, I See Spot, 1 of My Kind, Meadowmere Lane, Maureen & Kate Totes, Henry Road, and other vendors at this charity craft event. Cheryl Wallengren, the creative genius behind Sugar and Spice Clothing, is opening up her heart and home for this special event to raise awareness and benefit amyotrophic lateral sclerosis (ALS), also known as Lou Gehrig’s Disease. ALS is a progressive neurodegenerative disease that affects the nerve cells in the brain and the spinal cord. With this charity craft show, Cheryl honors the memory of her late husband Ernie Wallengren, who lost his battle with ALS in May 2003. “Gifts from the Heart” will feature a silent auction to benefit ALS, and a portion of the proceeds of the event will be donated to support the E.F. Wallengren Fund for ALS research. In addition to the show’s contribution to ALS research, Joie Studio will donate $1 for each item sold at the show and on Joie Studio’s online shop on December 15th(http://joiestudio.etsy.com) to the ALS Association. Tina Pham of Joie Studio states, “ALS is a debilitating disease that hits close to home. My good friend lost his mother to ALS, and this little bit of ‘craftivism’ is a simple way for me and my studio to help raise awareness and funds for ALS research.” Joie Studio will bring a huge portion of the studio’s current letterpress collection to the Calabasas show, including items that are not available online. Among items available for purchase will be holiday cards, thank you cards, all-purpose cards, coasters, and stationery gift sets. Joie Studio will also be able to take special and custom orders at the event. “Gifts from the Heart” will take place from 11:00am to 5:00pm at 23330 Park Hacienda, Calabasas, California. For further event information, please call Dani at 661-406-1464. To learn more about ALS, please see www.alsa.org. I've been racking my brains for a custom holiday card for Joie Studio. I was starting to freak out because I wanted to send a custom design instead of one of my stock designs with a message inside, which is probably what I should have done. But this card is the result and I'm so so thrilled at the way it came out! I wanted the card to be festive and fun yet have it be just a gorgeously printed card that shows exactly what letterpress is and what Joie Studio can do. So I printed it on super-duper thick, 600 GSM/220lb, 100% cotton, textured Crane's Lettra in Ecru. This is NOT stock you can shove through a printer, and it showcases the fact that letterpress can print on so many different types of art paper. The snowflakes are in metallic gold and metallic silver and the wording is in red. I have a blind deboss on the back of Joie Studio's logo. It was a lot of work, but I'm glad that my husband convinced me to do 3 colors! I'm going to send these cards to my suppliers, my custom order clients, and my best customers. 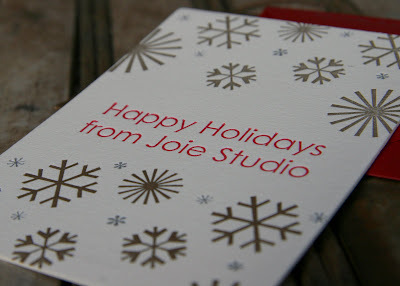 Happy Holidays from Joie Studio! Phones are SO last century! So, an odd problem just reared it's ugly little head. My business phone provider is going out of business and apparently since it's a special number, I can't just port it to any old service. The provider that I can switch to and keep my business number is WAY WAY too expensive. It's hard for me to justify paying a huge amount for a business phone number because I don't sit by the phone very often to hear it ring, and for my own safety, there isn't a phone installed in the press room, just my laptop with Wi-Fi. I call people back when I can, but right now the best way to get me is while I'm checking email while taking a break from letterpress work, since I'm finding that I'm ending letterpress runs after dark at times when I think it's too late to call people. I'm addicted to the Internet, so it's a safe bet that you'll find me online before you get me on the phone. So I have decided instead of moving to the recommended phone provider, I am going to be changing my phone service setup completely to one that integrates my voice and fax needs into one phone number. Which means a whole new phone number. And that people won't be faxing Washington State when faxing me in California. And that the new batch of business cards that I just printed is completely worthless. Sigh. At least the business is young and the number isn't too established. The current number will be in service until the end of 2007. Joie Studio will have a new phone and fax number in the beginning of next week. If you are ever at all confused as to how to contact me, just email me at info[at]joiestudio.com. I can call you, but please let me know what good times are to call. I'd hate to interrupt dinner! Great Post on Hapa Hale! 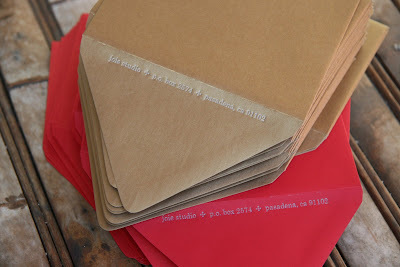 Yesterday, Leigh from hapahale.com posted a great write-up of Joie Studio on her blog. It's an awesome article about Joie Studio. Leigh, like me, is from Hawaii but now resides in Los Angeles, and she blogs about modern and fun island style! The write-ups on all the different design blogs have been great, but they've only been about one or two items. This write-up features my whole design studio, which is ever so awesome! Mahalo nui loa, Leigh!